Healthcare practitioners, including those from under-represented groups, will have successful and fulfilling careers serving diverse patient communities. 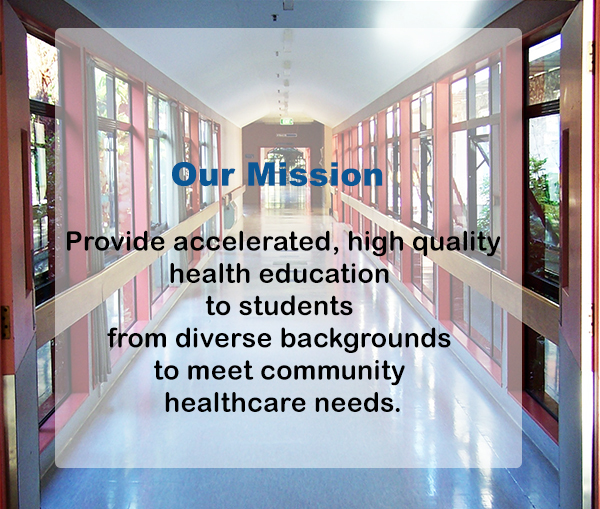 By using innovative educational strategies and by recruiting and developing the best instructors to meet the needs of all of our students' needs, we will provide the best health professional education. By demonstrating high levels of honesty, respect and responsibility, our leaders, instructors and students will be role models for the education and health community. By removing financial and social barriers, we will improve access to health profession careers for students from under-represented groups in society. By communicating respectfully, being supportive of health professional colleagues, protecting patient confidentiality and being honest of our own limitations, the instructors, teachers and students will function at the highest level of professionalism.